While we’ve been managing to get out and about each day during my Seattle sojourn, this has been somewhat limited to shorter outings that we can manage with the babies in tow, who by the way, have been rather busy melting Aunty Kym’s heart. And needless to say blogging has taken a back seat while I soak up as much Seattle-A time as possible while I’m here. But as the boys had a hot date with the paediatrition last Thursday (and Mummy and Daddy had the whole deal covered more than adequately), I decided to make myself scarce and get into Seattle for a day of sightseeing and shopping. 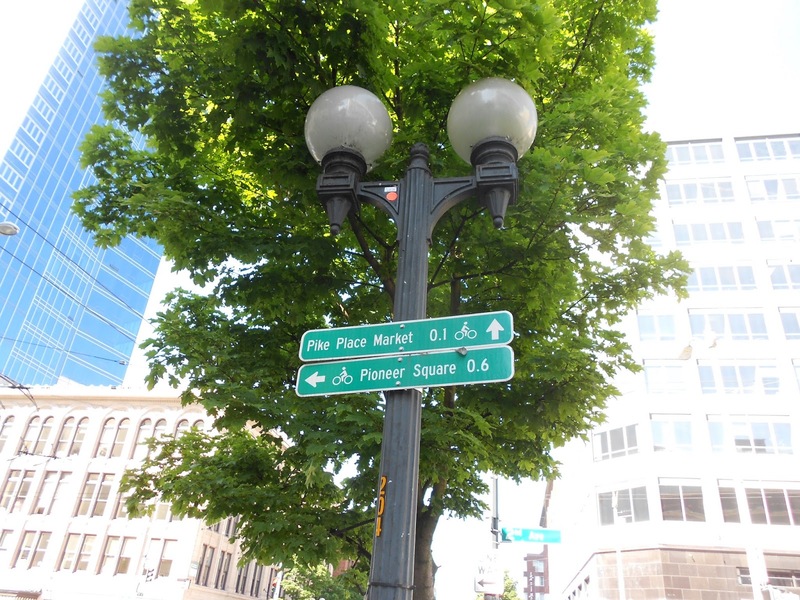 Seattle is a relatively ‘new’ town having been founded in 1851. That’s more than 70 years after the First Fleet sailed into Australia’s Sydney Cove, so this is an unusual position for an Aussie, used to being the youngster in the global village, to be in. It is also reasonably compact and very walkable, the streets are wide and tree-lined and there are coffee shops absolutely everywhere where you can rejuvenate. And despite my general aversion to Starbucks, the coffee, service and free wi-fi were both excellent and eminently helpful. All up I spent six hours and only covered the Downtown area. Arriving at Westlake on the express bus from Overlake Transit Centre (near Husband of Seattle-A’s work and a bargain at only $2.50 for a single 20min trip), I picked a few choice morsels from the guide book and just wandered around in between (more on that in another post). And the highlights? Well the weather was absolutely glorious but I have a feeling that was more good luck than good planning and quite frankly there’s not much anyone can do about that. 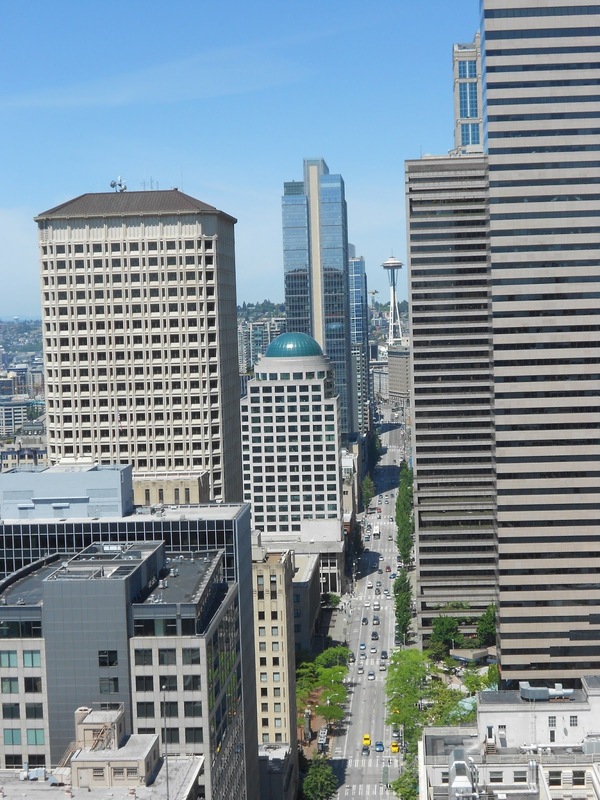 But for spectacular views no matter the weather, take the express lift up to the Chinese Room on the 35th floor of the Smith Tower just around the corner from Pioneer Square. The 36-42nd floors are occupied by a penthouse (yes, just one penthouse) but the 360 degree observation deck around the 35th floor is fantastic. Let me show you what I mean. Here’s a shot of the ‘other’ observation deck, the Space Needle. 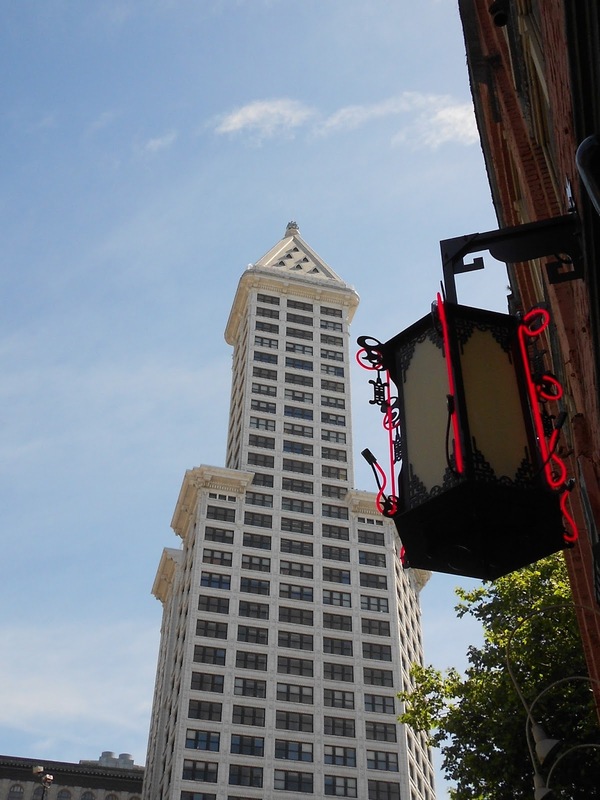 According to my Frommer’s guide, you get to pay about $17.50 for the privilege of being rotated (versus walking around the 35th floor of the Smith Tower for $7.50). The Mountain is out! 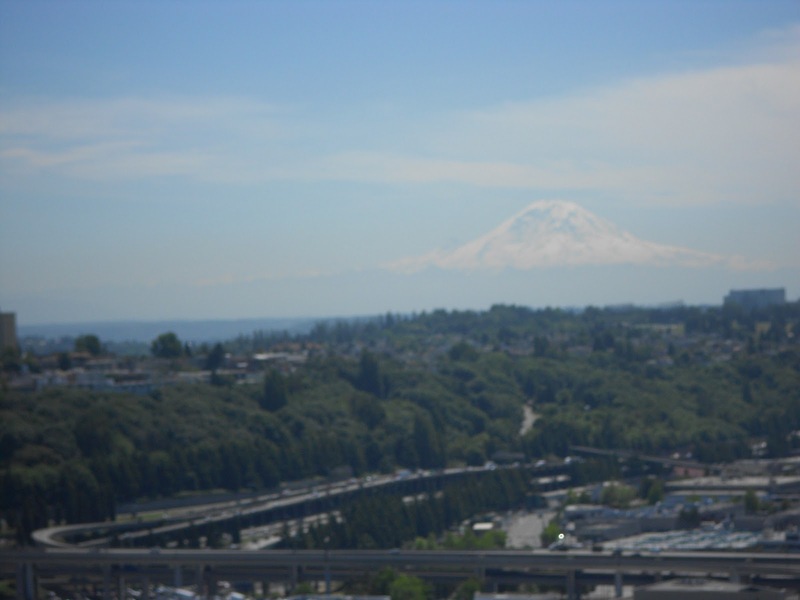 Mt Rainier looms through the clouds, an apparently unusual occurrence so I was thrilled to get this ‘on film’. 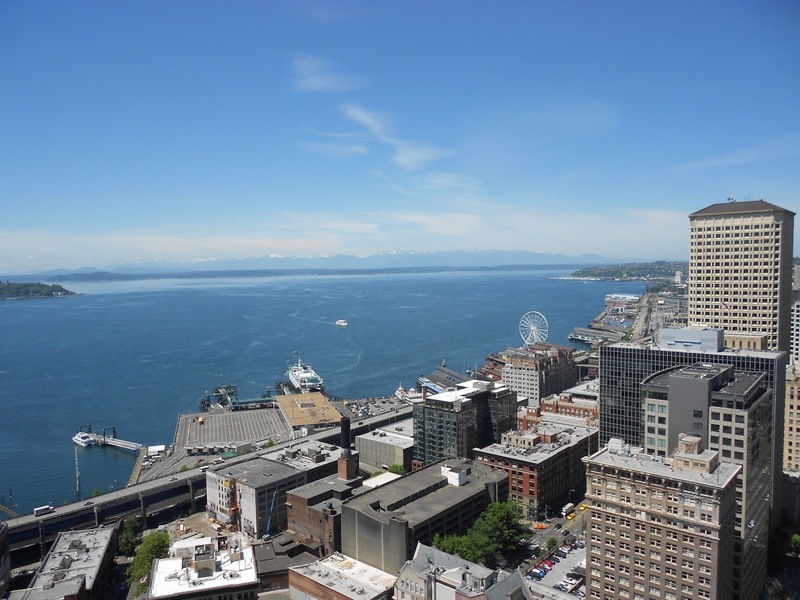 A glorious view over Elliott Bay to the Olympic Mountains and Puget Sound. 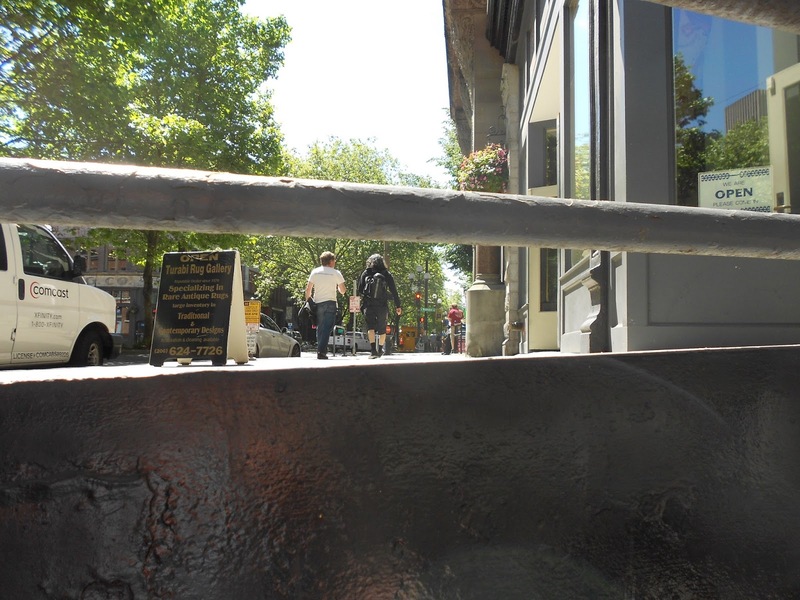 After you’ve had your fill of amazing views, it’s just a couple of blocks down the hill to Pioneer Square and into Doc Maynard’s to take the 90 minute Underground Tour of Seattle ($17.50 per person). 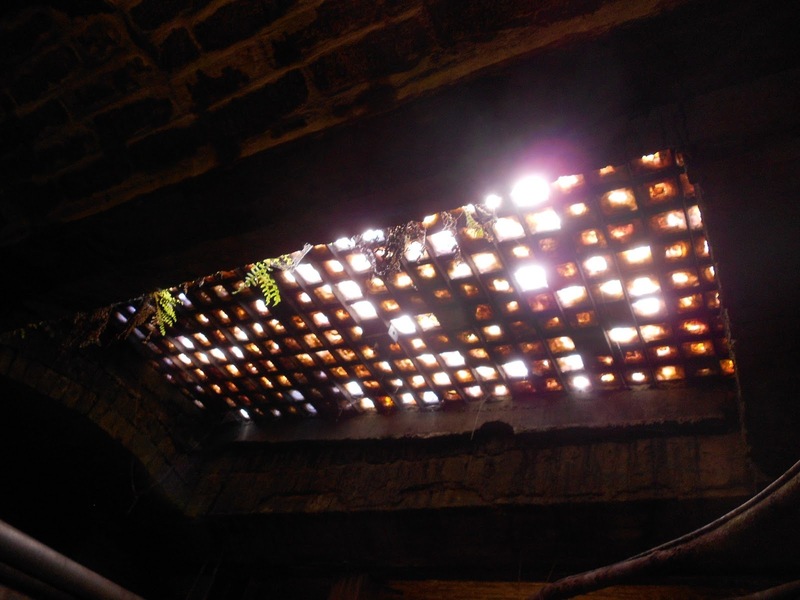 Filled with historic sound bites, this unique tour takes you beneath the streets of Downtown Seattle to explore this outpost of the Pacific Northwest’s seamy past. And me being, well me, I bought the book that forms the basis for the tour, Sons of the Profits by Bill Speidel. Absolutely fascinating stuff. 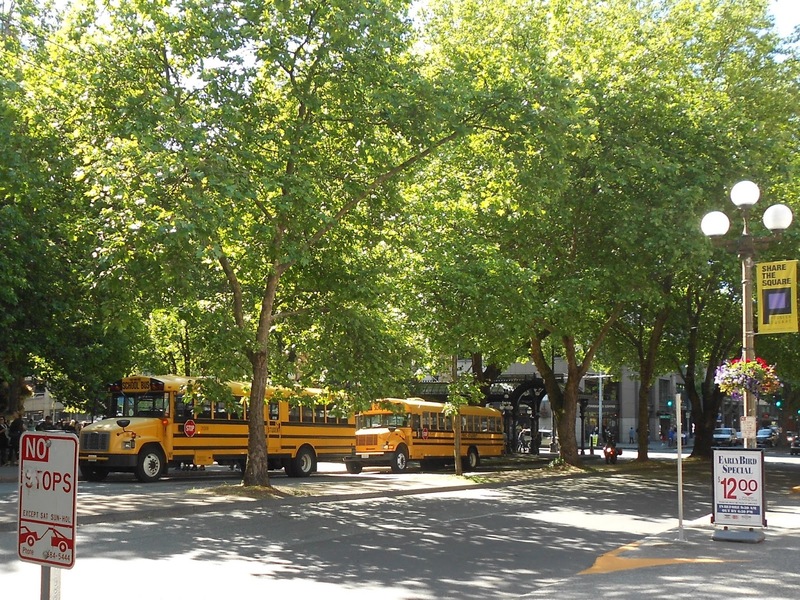 School buses lined up in Pioneer Square. Doc Maynard’s: your underground tour starts here! …to see the city from another perspective. 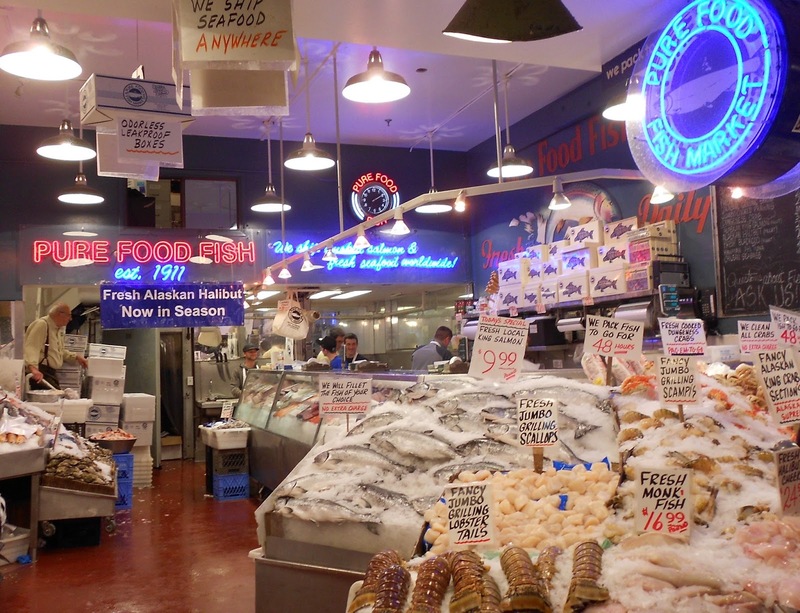 And a visit to Seattle wouldn’t be complete without a wander through Pike Place Market. 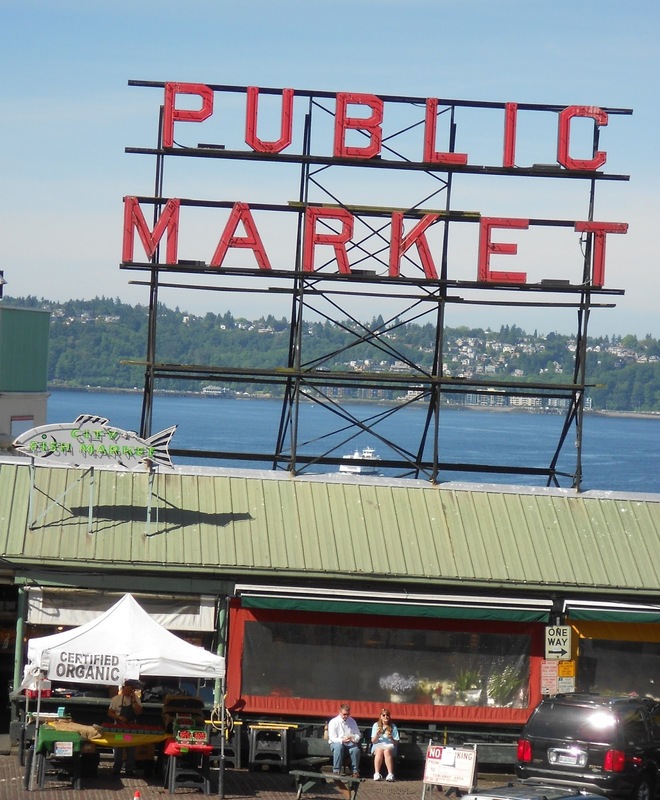 …but don’t forget to give a nod to the original Starbucks. 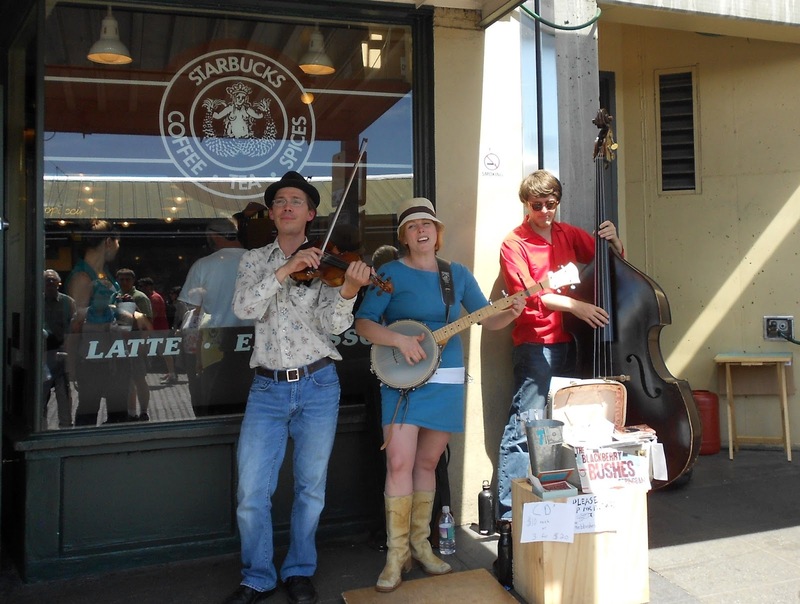 These happy buskers were playing a few tunes when I wandered by. Speaking of nods, being back in the States reminds me just how wonderful it is to be served. From the locals in the street to the staff in the stores and restaurants, people cannot do enough to help and want to make sure you have an amazing time in their city. Something that the rest of the world could take a few notes on. 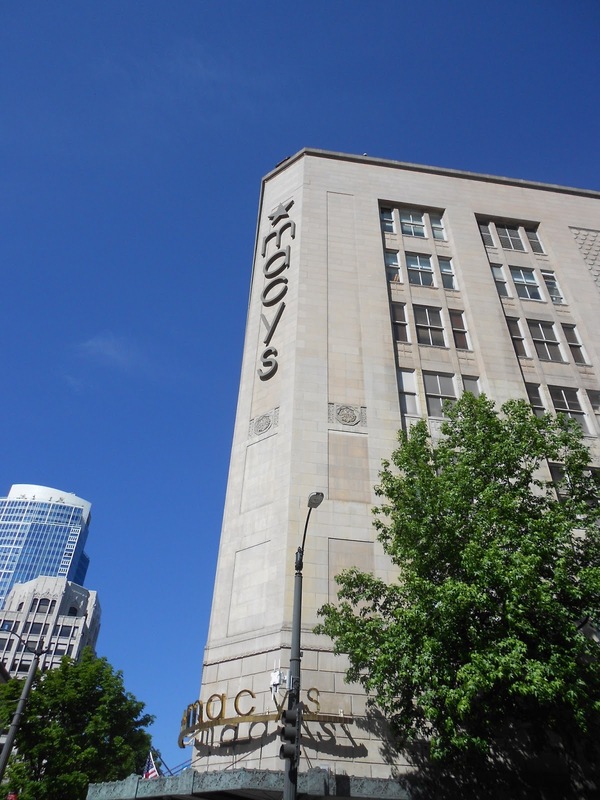 And finally it was time for a spot of shopping at Macy’s who were having a sale – God Bless America I say! And after finding some great bargains and nothing less than exceptional service, I only had a short block to walk to take my tired feet and satisfied smile back to the bus for the ride ‘home’. ps…You may have noticed that I didn’t race around to try and squeeze everything in (as I am usually wont to do). Well I figure this might just be the first of many visits – presuming Team-M will have me – so I thought I’d leave some stuff for next time! 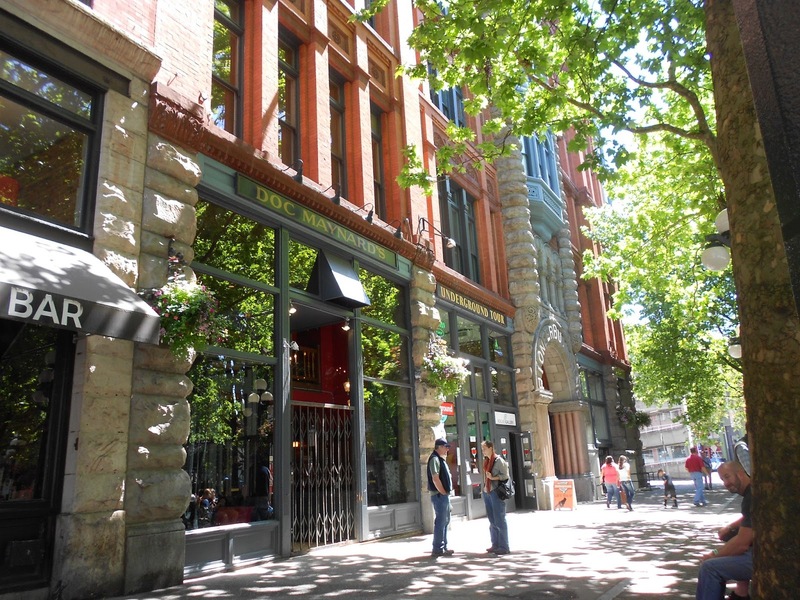 This entry was posted in A Traveller's Life, Armchair Tours, Australian Abroad, Seattle-A and tagged Pike Place Market, Seattle, Seattle-A, Smith Tower, Starbucks, the little dudes by Kym Hamer. Bookmark the permalink.